MONTVALE, NJ - The new 2012 C63 AMG Coupe designed by Mercedes-AMG combines distinctive design with a powerful drivetrain and dynamic handling. The new coupe joins the successful C63 AMG Sedan as well as the AMG family of coupes which includes the CLS63 AMG and the CL63AMG. The new coupe makes its U.S. showroom debut in September 2011. 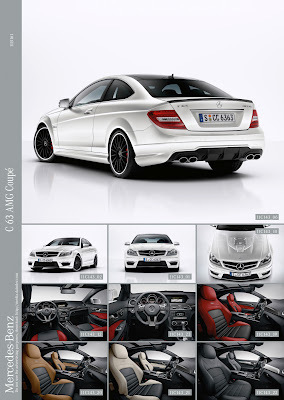 The AMG 6.3-liter V8 engine in the C63 AMG Coupe delivers a maximum output of 451 hp and peak torque of 443 lb-ft. Reflecting its outstanding performance, the coupe is capable of accelerating from 0 to 60 mph in 4.4 seconds with a top speed of 155 mph (electronically limited). With these specifications, the new two-door vehicle is poised to take the lead in its segment. The new coupe shares all the technology updates from the 2012 C63 AMG Sedan and features the AMG SPEEDSHIFT MCT 7-speed sports transmission with standard "Controlled Efficiency" mode, and a new power steering pump that helps to reduce fuel consumption. This reduction in fuel consumption also applies to the C63 Coupe when equipped with the AMG Development Package which generates 481 hp. This optional package improves acceleration from 0 to 60 mph to 4.3 seconds thanks to technology transferred from the SLS AMG. The forged pistons, connecting rods and lightweight crankshaft adopted from the gullwing model's high-tech drive system save 6.6 pounds in weight. This reduces rotational inertia and enhances the agility and responsiveness of the high-revving, eight-cylinder naturally aspirated engine. Top speed increases as well to 174 mph (electronically limited). Visually, the AMG performance package can be identified by the variable intake manifold finished in titanium grey under the hood, the AMG high-performance braking system with two-piece front rotors and red painted brake calipers, the carbon fiber trunk lid spoiler and the AMG performance steering wheel in premium leather with an Alcantara® grip area. The AMG SPEEDSHIFT MCT 7-speed sports transmission provides direct and agile power delivery. In place of the traditional torque converter, this innovative transmission features a compact, wet start-up clutch which reduces the power losses normally associated with conventional automatic transmissions and significantly lowers fuel consumption. The Controlled Efficiency "C" mode provides early, comfortable upshifts while maintaining the lowest possible engine speed and "soft" accelerator characteristics to help improve fuel economy. The exclusive Mercedes-AMG power transmission offers a high level of versatility and performance. The "S", "S+" and "M" modes deliver increased agility and are selected via the new rotary control knob familiar from the SLS AMG. Faster gear changes and higher revs add to the emotional experience as well as rev-matching in "S", "S+" and "M" modes. Gear changes in the "S+" and "M" modes take just 100 milliseconds and the RACE START function allows the driver to harness the vehicle's full acceleration capability. It’s not just the engine and MCT transmission which influence the C63 AMG Coupe’s aggressive character – the AMG sports suspension and AMG high-performance braking system are also key here. Compared with the standard suspension, the AMG coupe has a separate three-link front suspension, a reinforced multi-link independent rear suspension and a wider track front and rear. The stiffer elastokinematics, autonomous axle kinematics with more negative camber and larger anti-roll bars result in greater agility and lateral acceleration. 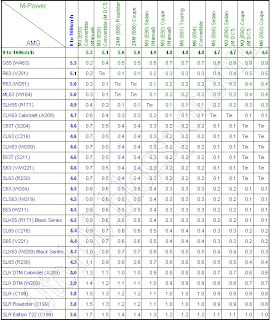 Specially adjusted spring and damper rates have optimized both the responsiveness of the suspension as well as road noise and tire vibration. The AMG speed-sensitive sports steering with a direct ratio (13.5: 1) provides excellent road feel and contributes to the nimble driving experience. The precise steering is complemented by three-stage ESP¨, the Electronic Stability Program that enables three individual control strategies to be accessed at the touch of a button. The driver can use the ESP¨ switch on the center console to choose between ESP ON, ESP SPORT and ESP OFF modes. The AMG high-performance braking system with internally ventilated and perforated discs at the corners provide maximum responsiveness, short stopping distances and high fade resistance. Visually, the coupe version of the C63 AMG has a confident, athletic presence that is reminiscent of the high-performance SL63 AMG roadster. The C63 AMG Coupe has a sinister low profile, powerful shoulderline and a narrow C-pillar, combined with short overhangs, long hood, steeply raked windshield and long, sloping roof. As is typical for AMG, the car has a striking, arrow-shaped front section with the new AMG front apron housing a high-gloss black horizontal edge, AMG-specific LED daytime running lights and side air outlets. The large Mercedes star sits on a wing-shaped transverse lamella in the new radiator grille, while a modified aluminum hood with powerdomes, emphasizes the strong character of the car. The new clear-lens headlamps are particularly eye-catching, especially when equipped with the optional Lighting Package which includes bi-xenon headlamps. The wide front fender bearing the "6.3 AMG" script, AMG rocker panels and the new 18-inch 5-twin-spoke AMG light-alloy wheels painted in titanium grey with a high-gloss finish dominate the side view. Excellent contact with the road is provided by the wide 235/40 R 18 (front) and 255/35 R 18 (rear) tires. At the rear, the unique AMG rear apron has a distinctive, black diffuser insert and three pronounced diffuser fins along with two chromed twin tailpipes of the AMG sports exhaust system. Inside, the instrument cluster with integrated screen immediately recalls the new CLS63 AMG with three separate round gauges providing information on speed, engine rpm, fuel level, and coolant temperature. Other display options are available through the AMG main menu accessible via the multifunction buttons on the steering wheel. The three-dimensional TFT color display located inside the speedometer welcomes the driver by showing an AMG logo. The specially shaped AMG performance steering wheel has been adopted from the CLS63 AMG and includes flattened top and bottom sections, metallic trim elements, grip areas trimmed in perforated leather, and aluminum shift paddles. The instrument cluster and center console are trimmed in high-gloss black piano lacquer while the dashboard and doors feature aluminum trim; optional carbon fiber or wood trims are also available. The rotary control for selecting the C, S, S+, M transmission modes and RACE START is situated on the center console. The new AMG sports seats with integrated head restraints, EASY-ENTRY system and AMG badges have a sporty design with horizontal stitching. Combined M-B Tex/DINAMICA black upholstery comes as standard. DINAMICA is a new type of breathable man-made fiber which is pleasing to the touch and is characterized by low emissions and high durability. The side bolsters of the AMG sports seats are covered in M-B Tex while the center panels of the seat cushions are upholstered with DINAMICA. The C63 AMG Coupe is a proper four-seater with the rear seats featuring the same style of horizontal stitching as the AMG sports seats. Standard split-folding rear seats help expand available cargo capacity. Optional leather interior appointments help individualize the inside with four single tone and three two-tone combinations. With nine airbags as standard, belt tensioners and belt-force limiters for all seats, the C63 AMG Coupe has extensive safety features. The airbags, which can deploy in milliseconds in the event of an accident, include front, side and pelvic bags for the driver and front passenger, a kneebag on the driver's side, and windowbags. With a number of driving assistance systems ranging from ATTENTION ASSIST drowsiness detection to Blind Spot Assist, the C63 AMG Coupe provides a comprehensive level of driver support and protection. The assistance systems are familiar from the flagship S-Class and are based on the latest radar, camera and sensor technology to help monitor and prevent frequent accident causes such as driving too closely, fatigue and darkness. The C63 AMG Coupe also features a new telematics generation which offers greater operating convenience, larger displays, phone book transfer, Bluetooth audio streaming and a USB interface now accommodated in the center armrest. The optional COMAND system now features SIRIUS weather information along with the familiar destination search/route download via Google. The COMAND navigation system also includes a new 3D display with city views, the ability to record and retrace a specific route, specific personal destinations can be saved or imported via an SD card and four alternative routes can be displayed on the navigation map, one of them an economical variation. The new C63 AMG Coupe will make its U.S. showroom debut in September 2011.